The saturation power of a laser gain medium is the optical power of an input signal which in the steady state leads to a reduction in the gain to half of its small-signal value. Similarly, the saturation power of a saturable absorber is defined. 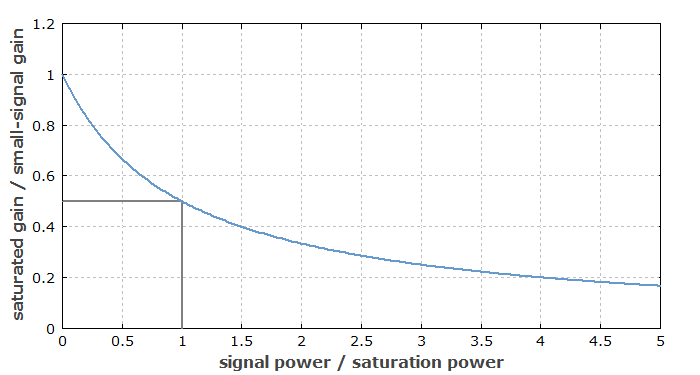 The saturation intensity is the corresponding optical intensity, i.e., the saturation power per unit area. Usually it is assumed that the gain is small, i.e. input and output powers are similar. For high gain, it is common to refer to the output power. where h ν is the photon energy at the signal wavelength, σem and σabs are the emission and absorption cross sections at the emission wavelength, τ is the upper-state lifetime, and A is the mode area. The quantity σabs is zero for four-level gain media but should not be forgotten for quasi-three-level gain media. Figure 1: Dependence of laser gain on the optical power, calculated for the steady state. When the power equals the saturation power, the gain is reduced to half the small-signal gain. A comparison with the equations for the saturation energy shows that the saturation power can be calculated as the saturation energy divided by the upper-state lifetime. It determines the amount of input power of an amplifier required for achieving most of the possible output power. The laser intensity in the gain medium of a four-level laser equals the saturation intensity if the pump power is twice the threshold pump power. This is remarkable, because the laser intensity in this situation is thus determined only by a property of the gain medium, not by resonator losses etc. For a saturable absorber, as used e.g. in a mode-locked laser, the ratio of continuous-wave intracavity power to saturation power is an important parameter for the initial pulse formation process. The saturation power should not be confused with the saturated output power, which is usually not precisely defined but means the output power achieved for an input signal power which causes significant amplifier saturation. Obviously, the saturated output power (other than the saturation power) depends on the pump power. A subtle detail is that the saturation characteristics can be modified if the pump intensity of the gain medium is comparable to or higher than the pump saturation power (which is defined as above, but based on photon energy and transition cross sections at the pump wavelength). In this situation, the rule that the gain is reduced by a factor of 2 for an intensity equal to the saturation intensity (as defined above) no longer holds. Even if pump saturation is significant at some location within a laser crystal or amplifier, it may overall not be important, provided that the pump absorption within the whole gain medium is complete. In such a situation, local pump saturation simply means that some of the pump power is absorbed at another location within the same medium, effectively not changing the overall saturation characteristics.